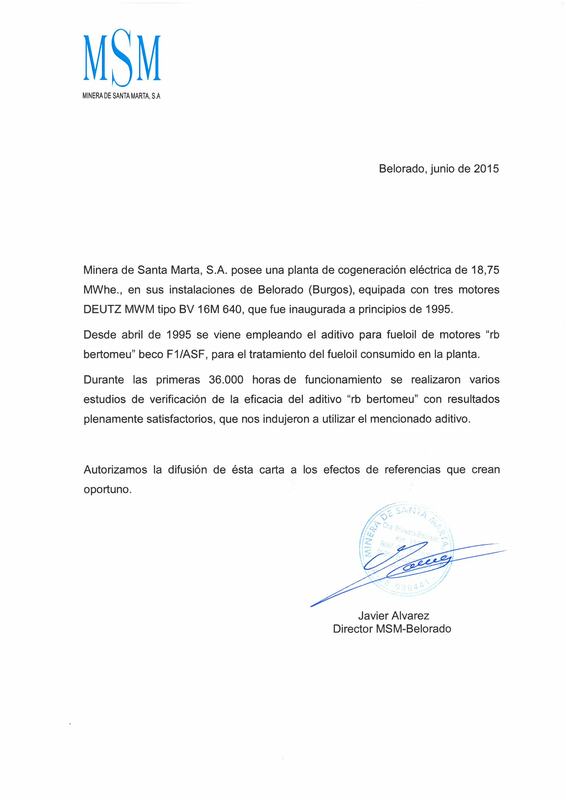 Minera de Santa Marta, S.A. owns a cogeneration power plant producing 18.75 MWhe at its facilities in Belorado (Burgos), equipped with three engines type DEUTZ MWM BV 16M 640, which opened in early 1995. Since April 1995 it has been using the engine fuel oil additive "rb bertomeu" beco F1 / ASF, for the treatment of fuel oil consumed in the plant. During the first 36,000 hours of operation we made several tests of the effectiveness of the additive "rb bertomeu" with full satisfactory results which led us to use the above mentioned additive ever since. In reply to your request, we are pleased to express the full satisfaction in our factory with the benefits obtained from the use of the "rb bertomeu" beco F2/A additive which we add to the fuel oil used (nº2) in our pirotubular boilers. 1. Important decrease in the number of pipes blocked by soot, increasing the interchange surface of the boiler. 2. Reduction of the hardness of the little encrustation that appears in the pipes, clearly reducing the cleaning time employed. 3. Removal of the encrustation of unburned fuel that appears in the burners, easing inspection, cleaning and improving the condition of the burners. Also, we would like to express also our satisfaction with the Technical Service supplied to us. In reply to your request, having reached 25,000 - 26,000 operation hours of 3 Deutz engines installed in our Cogeneration Plant in Belorado, we are pleased to express the satisfaction in our factory with the benefits obtained by the use of your rb bertomeu additive, which we have been adding to the fuel oil (nº 1 Bia and nº 1) for exactly 3 years (August/95 - August/98). - Notable total increase of the useful life of the exhaust valves, which practically doubles the value estimated by the manufacturer. Currently, 60% of the valves and 84% of the original valve baskets are in service, the remainder having been replaced gradually due to thermal fatigue or by not reaching the necessary minimum measures, as of approximately 20,000-21,000 operation hours. Also, we would also like to express our satisfaction with the Technical Service that offer, especially referring to the inspections of the engines, whose technical and photographic reports constitute a valuable element for the follow-up and statistical control of the evolution of the maintenance of our engines. In reply to your request, we are pleased to express the high degree of satisfaction in our factory after using your "RB Bertomeu" additive in our power plant in Belorado, where we burn fuel num. 1 Bia. Also, we would also like to express our satisfaction with the Technical Service that delivered.